Variant sudoku puzzles is a catch-all name given to games that are based to some extent on the rules of sudoku. 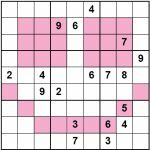 Over time many puzzles have been sold as a variant of sudoku in order to aid their popularity when in reality they are quite different - for instance when kakuro first came along it was often cited as a sudoku variant when in fact it is really a distinct game. Sudoku variants will tend to have different shaped regions, more regions, less regions or extra rules and constraints added to the pure or vanilla sudoku puzzle, which has the very familiar shape of nine rows, nine columns and nine boxes. Puzzles containing letters instead of numbers are a different display of the same puzzle rather than a variant puzzle per se, as the logic behind the generation and solving is the same, except the number symbols are substituted with some other symbols. Their complexity comes from being so familiar with using numbers. One sudoku variant is the Odd / Even Sudoku puzzle. This variant adds to your knowledge about the puzzle, and tells you that a specified set of cells in the puzzle either contain all odd numbers or all even numbers. For instance you'll see in the puzzle on the right that certain cells are coloured, indicating they are either all odd or even. You must use this fact to help you solve the puzzle, working out whether they are odd or even as you go along (this image is of a completed puzzle). We can also create variant puzzles with a variety of interesting and eye catching extra regions added to the puzzle. For instance here is an example of a sudoku puzzle containing extra sections that must each contain 1 - 9, in the shape of a smiley face. And they are not just for decoration either, because the extra knowledge of the fact each pink region contains each of 1 - 9 exactly once is essential to solving the puzzle without guessing. Publishers - Please contact us to buy Variant Sudoku puzzles for publication in your book, magazine, newspaper, any other printed media or online.